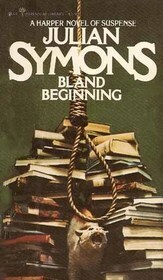 Bland Beginning by Julian Symons (1949) Synopsis: It all began when Tony Shelton found himself paying a hundred guineas for a book - a rare collection of his fiancee's grandfather's poems. It was supposed to be a present for his fiancee - but it led him into a tangle of forgery claims, fantastic offers for the book - and finally robbery, violence... and murder. This book is aptly named--for several reasons. First of all, it's one of Symons's earliest mysteries (third one, in fact). Second, although it is the third book written with the character of Bland, it shows us Bland before he becomes a police inspector and before he becomes a policeman at all. It shows us his first actual involvement in a case as a peripheral character and semi-suspect. And, third, the book truly does have a bland beginning. Most of the first half is like a bland diet--plain rice, oatmeal, vanilla pudding, toast...no seasonings and no spices lest we upset the tummy. It's like an anemic Wodehouse-wanna-be with a literary mystery thrown in. The characters are trying to be all witty and blithe and involved in humorous little misunderstandings, but it doesn't quite come off. to call on the young man once a week, and to discuss with him many subjects, generally connected with current crime. Very often the young man had an explanation to offer of a criminal case of the day, which seemed to Basingstoke ingenious, though it also seemed to him far-fetched. It was in the hope of being given some plausible explanation of events that Basingstoke called on his friend this Thursday night. From that time on, it's as if Symons's muse finally got down to work and told him that he needed to pep things up a bit. The characters suddenly have more life, the action seems to follow on logically, the wit is a bit sharper, and the misunderstandings seem funnier. It doesn't quite make it to Wodehousian standards, but it's a heck of lot closer. The mystery itself is a fairly good one. I certainly didn't pick up on all the clues and was still playing "pick the perpetrator" when the final wrap-up came along. Had the entire book met the standards of the second half, I would give this at least a full three stars--possibly a little over. As it is...two and a half stars.